As you might already know, BIM stands for Building Information Modeling. As a cornerstone of the AEC sector, BIM enables users to compile information on every aspect of a building. Using BIM, you can access every step involved in a project’s lifecycle—from time to cost to sustainability—in a single, integrated tool. However, there are countless benefits of BIM that you might not be aware of. Scan2CAD’s latest guide aims to go through the main benefits of using BIM, from high productivity to collaboration to energy efficiency. Read on for all the information you need. Sharing and collaboration are essentials throughout the AEC sector. However, in the past, collaborative working has often led to a number of problems. With projects often involving a number of different designs (and different versions of a single design), it’s no wonder that some confusion occurs. Now, however, teams can rely upon BIM’s cloud functionality to ensure a smoother process when working collaboratively. All stages of a project’s lifecycle are available through the cloud. This gives you the ability to view your projects onsite or offsite, and on any connected device. As such, it helps improve communication and coordination between teams. Everyone can review and mark up designs. And with a full version history of a project’s evolution, you no longer have to worry about file disappearances or corruption of files. Essentially, BIM helps to streamline and coordinate communication and collaboration between teams. One of the main issues with paper designs—or even 2D designs—is that they fail to encapsulate the entirety of a project. That is, you can’t always imagine the project in a real-world scenario. It’s for this reason that clients may often find designs underwhelming. BIM, by comparison, allows you to compile every aspect of a project into one complete design, including detailed floor plans and 3D models. Simulations provided by BIM can also allow users to visualize their projects in real-world situations. 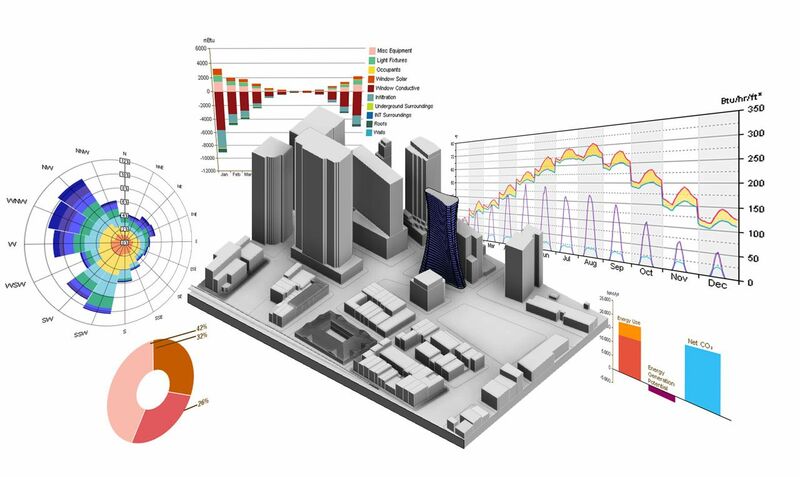 This enables users to visualize their projects at different times of day, and even view its overall energy performance. And with the help of Augmented Reality and Virtual Reality, you can see your entire design before you even go into construction. One of the main issues in the AEC sector is cost. The nightmare scenario is for a project to go forward into the construction phase only for architects to realize that there’s a clash in the structure. Whether it’s a pipe going through a wall or some other issue, one thing’s for sure: it’s going to be extremely costly to stall construction to “edit” the design. With BIM, however, you can automate clash detection. This means that you can detect clashes early on before you move onto building your structure. As such, you rarely have to deal with on-site clashes. BIM is even more cost-effective in that each step is recorded—which we’ll discuss further in the point below. As such, users have a record of every step in the lifecycle of a structure. This reduces the amount of documentation work necessary, as you don’t have to worry about duplication of designs or re-work. In this regard, you’re saving both time and money. As you can imagine, building a structure takes a lot of time and effort. A single project could involve hundreds of drafters, engineers and architects. Why is this an issue? Imagine a designer making a change to a floor plan, only to find that half of their collaborators are using the older version instead of the revised version. Even worse, they may be creating a 3D model based off of an old plan. The point is, it can be incredibly difficult to keep everyone up-to-date with the correct documentation. One of the major benefits of BIM is that each phase of design and construction is fully coordinated. You can easily see the step-by-step process for materials or crews, and so on. Each process is available for all members through cloud computation. With every step being well-documented and accessible, less time is needed to review each step. When it comes to building in the AEC sector, time is of the essence. If you mess up a stage in a building’s lifecycle, you end up setting back the entire project. With BIM, however, you’re not spending as long on projects, because everything can be planned in such a concise manner. When you’re using BIM, each object in your design is typically connected to a database. Each change you make to one aspect of a model will therefore be made to other models. So when you draw a line in a plan using BIM for example, the change is subsequently added to its corresponding 3D model. This is then automatically added to the construction plan and details. Essentially, each edit you make is made to every phase of a project. This means that the entire production process can be sped up and labor costs can be saved. It also means that client approval times are improved. Using BIM as an integral aspect of design means that you can integrate sustainability into your design process. Under traditional design and construction processes, you’d have to carry out environmental analyses after the design was complete. If any issues arose, it would be both costly and problematic. BIM, by comparison, allows users to produce early-stage environmental analyses. You can explore aspects like building orientation, energy use and daylight. With BIM, sustainability becomes a key component of the design process—you can now look at energy efficiency, waste management, water management and much more. Additionally, finding issues in analyses no longer sets the design process back—you can make quick and easy changes to virtual models instead of redesigning. There’s also a serious opportunity to create a paper-free AEC environment with cloud-computing and collaborative processes. With BIM’s collaboration capabilities, you can stay updated on even the slightest change. You no longer have to worry about some of your collaborators not being aware of a change you’ve made in a draft. Everyone involved in a project—from the architects to the construction managers—stays updated on even the smallest change in the building design. This makes coordination and management far easier than with traditional design methods. As we discussed in CAD file management, collaboration can be a difficult process when you’re not all using the same standards or conventions. With BIM, you don’t have to worry about this. If used correctly, you can easily work on any aspect of a project’s lifecycle, at the same time as other collaborators. If you weren’t already aware, BIM supports the entire building lifecycle process, from its inception to its construction to its future demolition. You essentially have a model or document for each phase of your project’s lifecycle. You can then optimize aspects like material usage and labor deployment to ensure efficient design and construction processes. The streamlined workflow of BIM also enables auto-save and a full file history, ensuring full data protection. Why is this useful? You can ensure that no data is ever lost. Continuity can therefore be ensured from the inception phase all the way to the structure’s eventual demolition. Essentially, BIM gives users a clear path to the end of their structure—whether you’re looking at it linearly or cyclically, everything is clear as soon as you begin moving forward with your design. One of the difficulties when it comes to the relationship between an architect and their client is that communication is not always as simple as it should be. Architects, engineers or designers may forget that while they’ve trained in a specialist field, their client isn’t as knowledgeable. So, when they’re trying to show a client a 2D plan, all the client might see is lines on a paper. How does BIM help? By offering incredible flexibility when it comes to communicating designs. You can show your client—or your colleague—a design in a technical or interactive format. Whether it’s your accrued costs or a virtual model, you can present all of your information in a succinct way. Using BIM, you can speed up communication between you and your client, and give further reassurance of your project’s legitimacy. An added benefit of BIM is that you can take your projects and models with you wherever you go. What exactly do we mean by this? Like mobile CAD, BIM is available whenever you need it through cloud computing. Everything is attached to a detailed database, so you have an overwhelming amount of information at your fingertips. You can then access this vast amount of information at any time, on any device. It doesn’t matter if you’re having a look to see if your project is properly coordinated or if you’re giving a client a quick preview of your project—everything is right there for you to use. Coordination is, therefore, much easier between teams and clients. Stay updated on all the latest news and guides in the world of CAD, CAM and CNC with Scan2CAD’s blog.